Ive been wanting a more traditional lookingcustom made leuku for ages. I have ended up on various knives far away from the original leuku-idea but Now, it seems theres something in these lines coming righ up. Actually two! Heres a smutty :) picture i took after i had drawn like 15 knives,and thinking it again and again,measuring and trying other leukus. 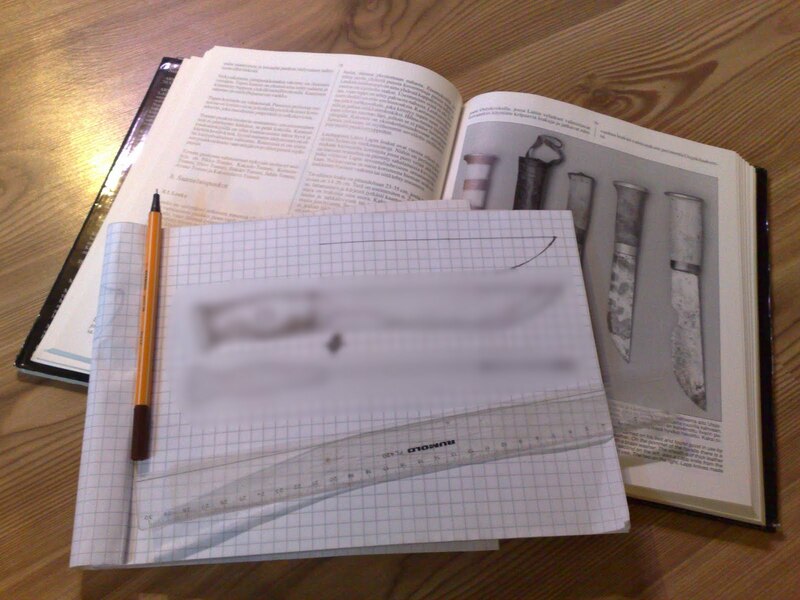 I talked for few hours at a time about it to Kotavuopio,and i sent one "final" drawing and listed some specs to him,but we agreed that he still can do it very freely, as he sure knows more about those northern knives than i do. I wanted it to LOOK like leuku at first look. Meaning that it wont turn into machete or any brutal chopping knife this time,heh. But, it will be,in sake of trustworthy durability, made in full tang construction. Some whittling bevel next to handle,slightly curved handle,and lanyard hole in between the two handle bolts,thats about it, other than that,its up to Teros hands and eyes,what will the final leuku look like. I dont want it to be any "hidden full tang" so there wont be nonsense fake bolsters,nor any needless several materials in handles. Just some hard wood and leather liners. 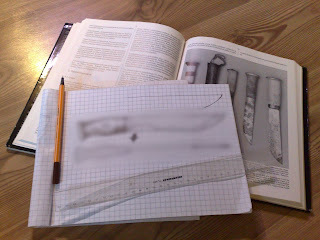 Blade will be something like 23 cm long,and 6 to 7 mm thick,and width will be from 35 to 40mm. Tero went far with it, with the blade thing. I would been more than ok,to have a one-material blade but he ended up making it with two forge welded steels, that are treated to be so called "bainite" steel ! Way good looking aint it ?!?!?! but already looking tasty indeed. BUT, this maker is that much of a professional and picky, that he wanted to make a "new" one as theres a minor cosmetic flaw in the forge welding joint and the handle aint curved. So, ill be waiting for this "failed" leuku to arrive to me,and ill finish it by adding the handles and finishing it overall,making a sheath to it and such. Now all i can do is to wait for the second one that TK wanted to do,and allready im going nuts :). Ive been using Kotavuopios blades and services quite a good time and never have i felt disapponted in anyway. All i can do is keep on recommending his products.